After sandblasting of concrete slab, colloidal nanosilica suspension is applied by brush, followed by grout pour. PHOTOS: De la Varga, et al. Colloidal nanosilica suspensions as a surface preparation technique increase the bond strength between precast components and the field-cast grout, say Igor De la Varga, José Muñoz, Robert Spragg, and Caleb Nickel, SES Group and Associates at Turner-Fairbank Highway Research Center; Lucas Bohn, Wiss, Janney, Elstner Associates Inc.; Ariana Fay, University of Buffalo; and, Benjamin Graybeal, FHWA at TFHRC, in their peer-reviewed paper, Nanosilica Coatings to Improve the Tensile Bond Strength of Cementitious Grouts. Yet prior research shows such grouts used for field-cast connections can vary widely in performance. “Many grouts demonstrate volume instabilities, which result in shrinkage cracking and a potential loss of bond to the precast element,” write De la Varga, et al. Bond performance improvements include use of rougher surfaces of the concrete PBE achieved by sandblasting, hydrodemolition or in-form retarder application; pre-moistening of the concrete PBE closure pour surface with water spray or wet burlap cover; and, use of bonding agents. The application of the nanoparticles as coatings, rather than adding the nanosilica to the bulk of the material as done in other concrete applications, reduces the amount of materials needed, thus lowering material cost. Their study used nanosilica coatings as bonding agents to improve hydration at targeted locations, that is, at the interface between the cementitious grout and the concrete PBE, with the goal of improving the bond performance. “The nanosilica suspension [was] applied directly to the concrete PBE surface before casting the cementitious grout,” the authors write.” The impact of nanosilica on the bond performance was observed using microscopy to evaluate the microstructure at the interface and demonstrated with strength testing. 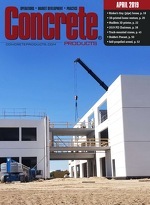 The tensile bond strength of concrete-grout interfaces where nanosilica coatings were added was considerably enhanced. The coating resulting from applying a 0.5 percent concentration of nanosilica suspension fully reacted after seven days of grout hydration. The reaction of the coating improved the contact between hydration products of the grout and the surface of the concrete, thus resulting in increased tensile bond strength at the interface. The increase in concentration of the nanosilica suspension from 0.5 to 5 percent used to create the coatings disrupted the contact between the grout and the concrete surface in specific areas of the interface. In these specific areas, both materials were separated by the presence of a 5 μm-thick gap caused by an excessive deposition of the nanosilica coating, emphasizing the need to optimize the thickness of the coating to enhance the contact between both materials at the interface. The dissolution and reaction of the nanosilica coating caused a reduction in the amount of unhydrated particles and porosity, and an increase in the amount of hydration products when compared to the control. This effect was observed in the grout paste located up to 100 μm away from the surface of the concrete. The use of nanosilica coating as bonding agents to improve bond performance of connections in PBEs would result in a slight cost increase with respect to the control. The change in performance-related environmental responses for precast/prestressed concrete pavement (PPCP) systems due to different conditions can be accurately forecast using finite element analysis (FEA), say Kukjoo Kim, Republic of Korea-U.S. Army Combined Division; and Sanghyun Chun, Bongsuk Park, Sangyoung Han, Engineering School of Sustainable Infrastructure and Environment, University of Florida-Gainesville, in their technical paper, Analytical Approach to Predict Environmental Behavior of Precast Prestressed Concrete Pavement System. PPCP systems have become more popular in recent years due to their ability to improve pavement performance, their cost efficiencies, and abilities to reduce construction time for early opening to traffic. “The peculiar characteristics of PPCP systems include the application of precast concrete slabs [that are] post-tensioned and compressed concurrently with longitudinal and transverse post-tensioning of steel strands,” the authors write. The 3-D FE model developed for PPCP system was capable of providing a reliable prediction in terms of the change in environmental behavior of PPCP due to different conditions. Curling stresses in PPCP system were greatly influenced by the change in prestress forces. The maximum tensile stresses in PPCP system occur at the edge of the slab along the transverse centerline where the region was diminutively affected by the prestressing force. Thermal stress predicted in the concrete slab increased significantly as the concrete modulus increased. This indicates that the higher concrete modulus will increase the curling stresses in the concrete that may result in increased potential for cracking of the PPCP panels. The maximum curling stress decreased with increase in subgrade stiffness. However, the effect of the subgrade stiffness on change in curling stresses appears to be relatively negligible. Corrosion-free carbon fiber reinforced polymer (CFRP) reinforcement now is available and can mitigate corrosion in prestressed concrete elements, such as beams, by reliably replacing steel reinforcement, say H. Celik Ozyildirim and Stephen R. Sharp, Virginia Transportation Research Council, in their peer-reviewed paper, Prestressed Concrete Beams with Carbon Fiber Reinforced Polymer. Virginia DOT recognizes the importance of corrosion-free reinforcement in prestressed strands, and has used CFRP strands in 18 piles of the Nimmo Parkway Bridge at Virginia Beach, they say. “New VDOT specifications require such reinforcement in piles exposed to severe environments, such as piles exposed to brackish water, saltwater or deicing salts,” write Ozyildirim and Sharp. The CFRP strands used by VDOT are called carbon fiber composite cable (CFCC) by the manufacturer, Tokyo Rope USA, Inc., and are manufactured at a plant in Canton, Mich. “This relocation to Michigan reduces CFCC delivery time to the precaster while maintaining CFCC’s desirable mechanical properties and a unique geometry that allows it to be coiled on a spool,” the authors write. After fabricating piles with CFRP, VDOT placed 22 beams with CFRP reinforcement in a two-span bridge in Halifax County, Va. The corrosion-free CFRP was used in both the strands and stirrups. The bridge has two continuous spans, each with four 84-ft.-long, 45-in.-tall prestressed bulb-tee beams. “While this bridge has a low traffic volume and is away from the aggressive coastal environment, the fabrication of these beams provided the needed experience for future use in a severe environment,” Ozyildirim and Sharp say. All reinforcement in the beams was CFRP. The stirrup was pre-formed at the plant in Japan and shipped to the prestressing plant in Virginia. The CFRP strand was shipped from Japan on spools to the precast/prestressed operation. The beams were designed by VDOT’’s Structure and Bridge Division with technical assistance from Nabil Grace from Michigan Technological University. The design followed ACE 34 and AASHTO guidelines and used the mechanical properties pertinent to CFRP. The prestressing force was kept at 65 percent of the guaranteed ultimate tensile strength. The CFRP was handled with care because of limited ductility and high sensitivity to heat. Also, CFRP strands need special end preparation to avoid crushing the end during prestressing, as the strand is strong in the axial direction, but weaker in the radial or transverse direction. First, two beams were cast using a traditional concrete mixture with conventional slump. Slump loss and reduced workability in concretes with conventional slump made fabrication of beams difficult, the authors write. Then, to facilitate the placement operation, self-consolidating concrete (SCC) mix was used in the remaining six beams. The SCC had high workability and made placement easy. The concrete for beams with either conventional slump or SCC was produced in a stationary mixer at the precast plant, where the samples for tests at the hardened state were likewise prepared. A commercially available air-entraining admixture and high-range water-reducing admixture were included in the mix design. After the release strength and dimensioning, beams were removed from molds and kept at the storage yard of the plant. When concrete reached the minimum 28-day strength of 8,000 psi, the beams were delivered to the jobsite, with each truck and trailer transporting a single member. Two cranes were then used to place each beam. Prestressed beams with CFRP with satisfactory strength and very low permeability were fabricated successfully at a local prestressed plant with local crew. CFRP strands required end preparation for prestressing. A daily cycle planned for beam production with CFRP was not achieved because of delays attributable to CFRP end preparation, and lack of steam curing that delayed the achievement of the release strength. Once fabricated, the beams with CFRP were handled, delivered, and erected in the same manner as any other beam. SCC was much easier to place than concrete with conventional slump. Bridge deck concrete had satisfactory strength and very low permeability. Night placement of the deck to minimize cracking was successful. A study shows the feasibility of using a prefabricated ultra high performance concrete (UHPC) shell as stay-in-place formwork, say Atorod Azizinamini, Ph.D., P.E., director, Accelerated Bridge Construction, University Transportation Center, and Shahryar Reheat and Amir Sadeghnejad, all of Florida International University, Miami, in their technical paper, Enhancing Resiliency and Delivery of Bridge Elements Using Ultra High Performance Concrete as Formwork. The superior properties of UHPC provides an excellent means to enhance the service life of bridge elements and make them resilient against weather, while eliminating the need for placement or removal of formwork, Azizinamini, Rehmat, Sadeghnejad write. As a proof of concept, combination of experimental and numerical study was conducted. Prior to conducting experimental work, numerical study in the form of a finite element (FE) analysis was carried out to investigate performance of the UHPC shell during placement of the normal concrete. To provide a base line comparison between UHPC shell formwork and conventional methods, two large scale specimens were constructed and tested under three-point load setup. “The shell test specimen demonstrated flexural strength, 14 percent greater than companion normal strength concrete specimen,” Azizinamini, Rehmat, Sadeghnejad write. The UHPC shell test specimen did fail as debonding of the shell at the interface took place, with development of a large crack in the shell. Compared to control beam made by conventional methods, the UHPC shell beam demonstrated an increase in flexure capacity by 14 percent, and ductility by 30 percent. The ribs set inside the formwork shell did not provide sufficient bond for composite action. Improvement to shear transfer mechanism through use of shear studs or closely spaced ribs needs to be considered. The strain behavior during load tests exhibited a gradual increase in difference of strain for surface and embedded vibrating wire gauges. This difference is attributed to gradual debonding of shell formwork from normal concrete (NC). The shrinkage monitoring indicated that NC inside the UHPC shell experienced shrinkage, resulting in tensile stress in NC. Because of the system being in equilibrium, the tensile stress in the NC is balanced by compressive stress in UHPC shell. The thickness of formwork shell was based on preliminary FE analysis. However, the actual thickness provided in the experimental study was conservative. Based on experimental results, the FE will be calibrated and a parametric analysis carried out to optimize the proportions for economy. From a construction stand-point, self-consolidating properties and flowability allowed shaping UHPC into a shell configuration. The fibers in the UHPC were uniformly distributed over the depth of the shell. Shrinkage cracks were not observed in either UHPC or the post-poured NC.